KSRealityBites: Texting/Browsing in traffic is a risk of life! Texting/Browsing in traffic is a risk of life! A recent study has found that over half of the pedestrians risk their lives by using a mobile phone while crossing a busy road! 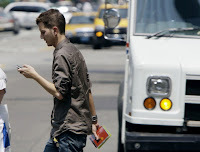 Many people has been found either emailing or texting in traffic in common place. With 58% of men & 53% of women spotted either texting or browsing the web via their cell phones which is reported by the Daily Express quoting the survey. According to the researchers in London, Manchester, Edinburgh & Cardiff, they also witnessed hundreds of pedestrains distracted by their iPods or MP3 players. Almost one third admitted their safety was "extremely impaired". One in ten owned up to regularly crossing the road while glued to their electronic gadget. Also 4% confessed to sending emails & text messages while weaving between moving cars & heavy vehicles. 10% of the drivers revealed that they'd had a near miss with a pedestrian using a gadget in the past five years! Well, crossing a busy highway while browsing/texting without paying attention to oncoming traffic & pedestrians is very dangerous. Not only in London, Manchester, Edinburgh or Cardiff but even in almost major parts of the world doctors cite rising reports across the countries thousands of hundreds of injuries involving text-messaging pedestrians, bicyclists, skaters & motorists. Most involve scrapes, cuts & sprains from texters who walked into lampposts or walls or tripped over curbs. In the worst case scenarios, people get killed being hit by pickup trucks or heavy vehicles while crossing the street either texting or emailing to their friends or friends or partners. The reports of incidents on some other grounds, headlines as some person fell off his horse while texting, suffering head & back injuries or sometimes indoor incidents like a girl suffered belly, leg & arm burns after texting while cooking noodles! There is not only texting/browsing while crossing the road has the major incidents but texting while driving too is evenly dangerous. Texting while driving may seem harmless, but the number of people impacted by this foolish decision grows day after day. While efforts are being made by the awareness departments via big banner ads or television ads to curb texting & driving, it is up to us as a society to ignore the calls or texts & reply/check to those pending calls or texts later after driving. Millions of driver's are talking on the cell phone, checking their email, & even texting while they are driving. Although most driver's seem to understand the message not to "drink & drive," they are less aware of the risks of cell phone use while driving. Many cell phone users don't realizing that by taking their focus off the road they are just as bad as a drunk driver, & when it comes to texting they are even worse! People 've to keep their cell phones away & drive safely. They 've to keep in mind that their messages will be there when they arrive at their destination. They 've to make sure that they arrive safely too. A researcher named David Strayer guest starred in the Oprah Winfrey show long back where he explained the studies conducted on how the human brain works & why people cannot multitask like they think they can. Although many people swear they are an expert of doing two or more things at once. Strayer's research shows that while talking on a cell phone a driver is four times as likely to get into an accident (About the same risk as driving drunk). Texting while driving is worse than driving drunk! Those who text message while driving are eight times as likely to be involved in an accident, as they are suffering from "inattention blindness," which means the brain is only processing about half of the information around them. Making it easy for a driver who is texting to miss a red light, stop sign, or pedestrian crossing the street. David Strayer has been studying distracted drivers for ten years & says that someone who is texting while they drive is actually driving worse than a drunk driver! A humble request to all my readers not to use cell phones while driving or while crossing the street & lets take a pledge "No Cell phone Usage while Driving or Crossing Streets". It is a sincere belief that this post will make drastic change in the mind of the people. Let it be the end, the end of you using a cell phone or sending a texts when you are behind the wheel of a moving vehicle. Until we as a nation decide we are going to change that, those numbers are only going to go up! Do tell your friends & family to stop driving while they are on their cell phone & also do continue checking your text messages or emails after crossing the road/street parking your vehicles or staying in a safe place. Please do share this post with your family & friend circle if you really care about them! As Always, Do Take Care.. Stay Healthy, Stay Safe!